Membrane Characterization provides a valuable source of information on how membranes are characterized, an extremely limited field that is confined to only brief descriptions in various technical papers available online. For the first time, readers will be able to understand the importance of membrane characterization, the techniques required, and the fundamental theory behind them. 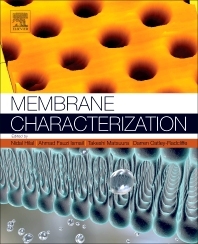 This book focuses on characterization techniques that are normally used for membranes prepared from polymeric, ceramic, and composite materials. Professor Nidal Hilal is the Director of Centre for Water Advanced Technologies and Environmental Research (CWATER) at Swansea University in the United Kingdom. His research interests lie broadly in the identification of innovative and cost-effective solutions within the fields of nano-water, membrane technology, and water treatment including desalination, colloid engineering and the nano-engineering applications of AFM. His internationally recognized research has led to the use of AFM in the development of new membranes with optimized properties for difficult separations. He has published 6 handbooks, 43 invited book chapters and around 450 articles in refereed scientific literature. He has chaired and delivered lectures at numerous international conferences. In 2005 he was awarded Doctor of Science (DSc) from the University of Wales and the Kuwait Prize for applied science “Water resources development”. He is the Editor-in-Chief for the international journal Desalination. He sits on the editorial boards of a number of international journals, is an advisory board member of several multinational organizations and has served on/consulted for industry, government departments, research councils and universities on an international basis. Professor Takeshi Matsuura is a senior academic with a career spanning more than 50 years and has held several distinguished posts in many countries including the USA, Canada, Japan, Germany and Singapore. Most recently he joined the University of Ottawa (1992) as the British Gas/NSERC Industrial Research Chair. He served as professor of the Department of Chemical Engineering and the director of the Industrial Membrane Research Institute (IMRI) until he retired in 2002 and was appointed as professor emeritus in 2003. He received the Research Award of International Desalination and Environmental Association in 1983. He is a fellow of the Chemical Institute of Canada and a member of the North American Membrane Society. He has delivered plethora of invited lectures and presentations to many of the world’s foremost scientific events and conferences. He has published over 400 papers in refereed journals, authored and co-authored 6 books and edited 8 books. A special symposium was held at the Eighth Annual Meeting of the North American Membrane Society to honour Prof. Matsuura (together with Dr. S. Sourirajan) for life-long contributions to membrane research and a similarly the International Conference on Membrane Science and Technology 2013 was held in his honour. In addition, he has received the George S. Glinski Award for Excellence in Research and the occasion of his 75th birthday was marked with a special edition of the journal Desalination. Dr Darren Oatley-Radcliffe holds a degree in Chemical and Biological Process Engineering from the University of Wales in 2000, receiving a commendation in the IChemE PENCE prize and the BOC Shuftan memorial prize. Following graduation, he proceeded to read for a Ph.D within the same department under the supervision of Prof. W. Richard Bowen FREng FIChemE. He specialised in membrane separation processes, in particular the complex micro-hydrodynamics and interfacial phenomena associated with aqueous nanofiltration. In the fall of 2004, Darren accepted the post of Senior Process Engineer with GlaxoSmithKline R&D Ltd and developed expertise in cGMP batch production of pharmaceuticals and developed as an industrial process engineer. He received several awards and promotions and was asked to aid in the Innovative Manufacturing Initiative (IMI) (the development of the world’s first fully continuous primary pharmaceutical processing facility). Having successfully completed the inaugural campaigns in this landmark facility, he was awarded the title of ‘Vanguard’ at the GSK CEO Sustainability Awards 2009 and was further promoted to Investigator. In the spring of 2010, he returned to academia and joined Centre for Water Advanced Technologies and Environmental Research (CWATER) at Swansea University, UK. He has led several research projects and has published over 20 refereed papers in the fields of membrane technology, algal processing and pharmaceutical manufacture.